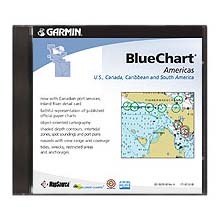 MapSource BlueChart is Garmin's exclusive marine cartography. It was developed to provide mapping flexibility and options you've never had before. BlueChart CD-ROMs provide the same detailed, object-oriented cartography as the pre-programmed BlueChart data cards, including specific region breakdowns. Coverage is broken down into different regions. A region must be unlocked prior to use. With the purchase of MapSource BlueChart CD ROM, customers will have access to one region area of their choice. The region can be unlocked through Garmin via their web site or by phone. You can reprogram the data card whenever you want by simply downloading different areas.